The Vancouver Chamber Choir and guests Cantata and Pacifica singers performed during the first half of the programme in a cappella the Slavonic Liturgy by Russian master Sergei Rachmaninov and then in the second half, just the VCC alone together with the VCC strings orchestra, the world premiere of the latest new work by Imant Raminsh, The Mystical Bond, a multi-language tribute to universal brotherhood. The mood was sombre and nostalgic, as it should really be on Good Friday. Artistic and Executive Director Jon Washburn asked for donations at the offstart for Japan for the recent tsunami that destroyed northern Japan and took thousands of lives, and introduced the Consul General who was sitting in the Lower Lodge. He then gave an anecdote about a Japanese man who went out of his way to help him when he was lost in a Japanese train station, showing the compassion and good-heartedness of the Japanese. The choir then did a special number, a Japanese song (not in the programme). Russian composer Sergei Rachmaninov's composition of the Liturgy of St. John Chrysostom was then sung magnificently by the VCC together with the Cantata and Pacifica singers all in a capella. At the end of the 19th century, Russian church musicians wanted to create their own compositions after being influenced for so long by Italian and German sacred liturgy compositions. Rachmaninov's composition of the Liturgy of St. John Chrysostom was one of them, and has been regarded as the culmination of this Russian "revival". In the second half, Latvian composer Imant Raminsh's The Mystical Bond, a compilation of poems by different poets reflecting brotherhood was sung by the VCC. 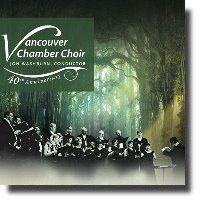 The songs were quiet, laid back, almost sad, serene, and nostalgic, and the singers accompanied by strings from VCC's orchestra, rendered the homage in what Raminish intended the compositions to be. The last one, "Serenas palabras", a poem by Nobel prize winner Gabriela Mistral of Chile, the composer says, in his notes, is dedicated to his younger brother who died recently. The audience fully appreciated this 40th anniversary concert with bravos and a standing ovation.